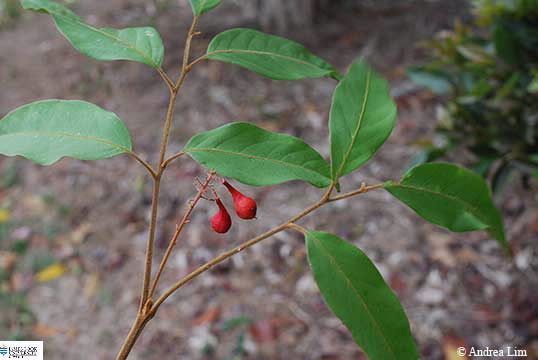 This tree has alternate leaves with 6-8 leaflets per compound leaf, leaf blade to 18 cm long and 8 cm wide. Small domatia may be present in the axils between the laterals and the mid vein of the leaflet. Flowers in panicles, petals 5 white, stamens 8. Fruit an orange to red capsule; the seed is almost covered by an orange-red aril which has a basal spur.